Donna Fargo, country music star, will be signing copies of “My Prayer For You” at Brentwood, TN. Donna Fargo’s first album, The Happiest Girl in the Whole U.S.A., achieved platinum album status and earned her a Grammy. Donna’s credits include seven Academy of Country Music awards, five Billboard awards, fifteen Broadcast Music Incorporated (BMI) writing awards, and two National Association of Recording Merchandisers awards for best-selling artist. Prior to achieving stardom, Donna was a high school English teacher. It is her love of the English language and her desire to communicate sincere and honest emotions that compelled Donna to try her hand at writing something other than song lyrics. Her writings appear on Blue Mountain Arts greeting cards, books, calendars, and other gift items. There are some people you feel a special connection with, and you want to reach out and let them know how much you care. You want to send them good wishes to lift them up and cheer them on. You want to remind them of what a gift they are to you and to the world. And you want to tell them to keep believing and trusting in God, no matter what. Grammy-Award winning performer-songwriter Donna Fargo has filled this book with messages of hope and appreciation to brighten the life of someone close to you. She encourages each of us to focus on the positive and to remember that God hears us when we call and will provide the answers that we need. She challenges us to listen to our heart and have faith that all things are possible. 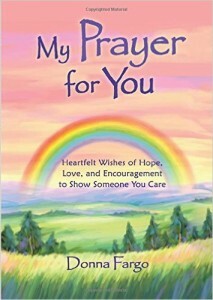 This book is a rainbow of love and support… and it’s a wonderful way to let a treasured person know they are always in your thoughts and prayers.